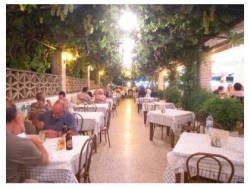 A few years ago Mike went to Alykanas on Zakynthos to get a behind the scenes look at one of his favourite Greek restaurants: the Mantalena. He wrote a piece for The Times about a day in the life of the Mantalena, but didn’t expect to be challenged by the manager, Tasos, to work as a waiter in the evenings! He discovered just how hard those waiters work on a busy night, from setting up the tables before the doors open till the early hours of the morning when the final customers have left and all the staff wind down together with their own meal. I wouldn't be taking the orders as I don't write Greek and the kitchen staff don't read English, but I could greet people, seat people, bring them a menu and the complimentary glass of ouzo, then clear away the debris afterwards. It would take a bit of pressure off the others. It was only early June, but by mid-evening all fifty tables would be full: That's at least a hundred people needing menus, ouzos, bread, wine, starters, main courses, puddings, brandies, coffees or their bills. I soon discovered that the one thing a waiter doesn't do is wait. There's no time. Hello, good evening, please have a glass of ouzo with our compliments, another beer of course, should I clear those plates away, take two moussakas to table 24 and they need some new knives and forks and pick up a chicken souvlaki from the grill on the way, we're running low on ouzo, I'll get your bill at once, hello, there are some empty tables around the side, please have a glass of ouzo, now whose is the stuffed squid, another carafe of house white, certainly, your bill, thank you, I'll just get your change, two coffees and a walnut cake table 13, where are the clean tablecloths, is there a spare bottle opener, hello, how are you, would you like a glass of ouzo? Occasionally you take a sip of water and wipe away the sweat caused by running around on a hot evening, into and out of the kitchen. It's almost midnight before Tasos takes the final bill. As the last customers leave, we bring in the salt and pepper sets, the ashtrays, the menus, the final trays full of debris. Natasa is sweeping up, and the kitchen staff are madly washing down the surfaces. Tasos's mother Soula starts cooking at 5.30 in the morning, and demands a clean kitchen when she arrives. Zoe is cooking one last meal - for the staff. At 12.45 we tuck into tsatsiki, chips, salad, pork, chicken, moussaka, stifado, rice and a few bottles of beer. 'Early tonight,' says Tasos. 'In August we'd still be serving now.' Afterwards he empties the tips bowl and divides it amongst the real waiters. While Tasos and Zoe work out what's wanted for the next day, I crawl away to my bed, take off my sweat-soaked white shirt, and resolve to leave bigger tips in future. 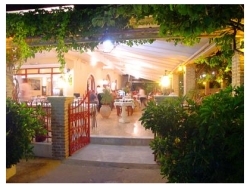 My stint as a waiter at the Mantalena Restaurant in Alykanas on Zakynthos was a few years ago now, but the restaurant is still there so check it out and say hi from me. Don't miss our page about Tipping in Greece. This story first appeared in Time Out magazine in London, and is also included in Mike's book, Snakes Alive and Other Travel Writing, published by Blue Sky Books. in the Mantalena Restaurant in Alykanas. 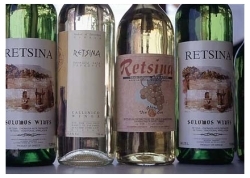 Read about a Zakynthos Winemaker. 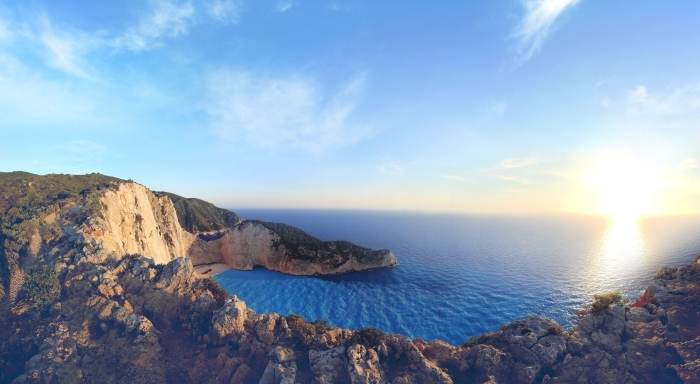 Be inspired by Photos of Zakynthos.